New York City-based iBuyer Perch on Tuesday announced the completion of a $220 million Series B funding round with $20 million in equity funding and $200 million in debt financing. Long-time Perch investors FirstMark Capital, Accomplice, and Juxtapose led the funding round, bringing the company’s fundraising total to $230 million. In a rich iBuyer market filled with more established players such as Opendoor, Offerpad, and Zillow, Perch founder and CEO Court Cunningham said his company is differentiating itself by offering services that focus on making selling and buying easier — not just selling. Currently only available in San Antonio, Perch’s Buy and Sell service provides sellers with an all-cash offer that’s valid for six months — enough time to help them find a new home. To participate, sellers must fill out a short questionnaire that provides basic information about their home, which must be a single-family structure built between 1974 and 2014 with a valuation between $125,000 and $400,000. Once approved, Perch’s affiliated broker, Perch Realty, will send an all-cash offer within 24 hours. The offer is based on the most up-to-date market data, expert input from Perch’s agents, and the home’s overall condition. From there, sellers will sign a purchase agreement with Perch, and schedule a home inspection to determine what repairs, if any, need to be made. Once the inspection is completed, Perch will provide sellers with a final offer that deducts repair costs. 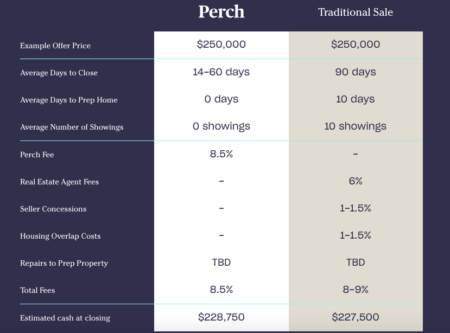 Then, Perch will begin the next part of the process, which includes mortgage pre-approval and matching sellers with a Perch agent who will show them Perch-owned listings and listings from outside brokerages. If the seller chooses to buy a Perch-owned listing, they will make sure separate agents represent both sides of the transaction. The closing for both properties can be scheduled to happen on the same day and sellers will pay a fee equal to six percent of their home’s sales price. 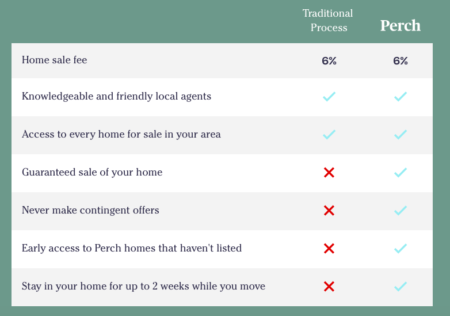 In this scenario, there is no buyer’s agent fee, explained Perch. If a seller using the Buy and Sell service doesn’t find a new home, they can cancel the sale of their home to Perch — no strings attached. If a seller finds a home outside of San Antonio, they can switch to the Sell Only service. Once a seller switches to the Sell Only service (or chooses it from the beginning), they have 60 days to close after accepting the post-inspection final offer. At closing, sellers will pay an 8.5 percent fee to Perch, plus any additional closing costs, such as title insurance policy, attorney and escrow fees, and HOA transfer fees. Within six months of its June 2018 launch, Perch secured a two percent market share in San Antonio. In an interview with The Real Deal , Cunningham said he believes Perch can double that within the next few years, especially with the company’s recent expansion to Dallas-Fort Worth and upcoming launch in Austin.